Wish 3. 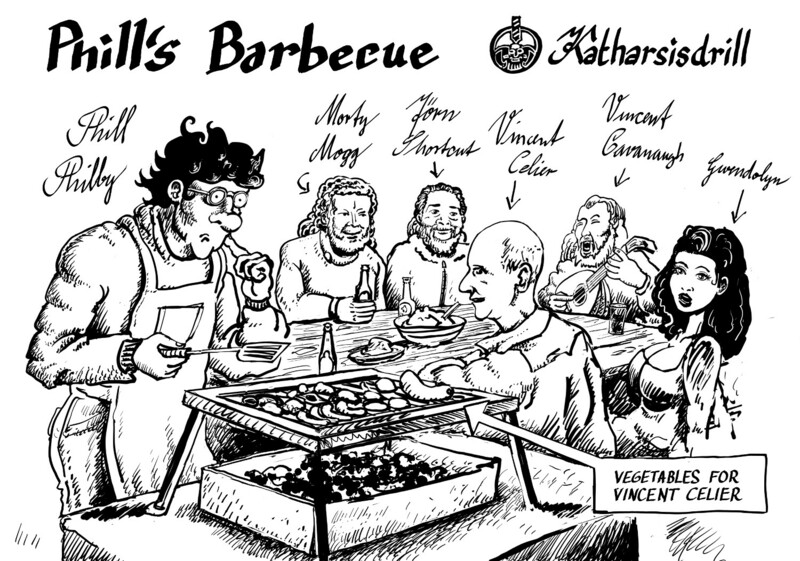 Phill's BarbecuesteemCreated with Sketch. From all of me to all of you! Free wish for a drawing. Press the image for a higher resolution! He is of course referring to Phill Philby, the protagonist of my comic about Phill from GCHQ So I have made a drawing inked directly without a pencil sketch - a bit like the ones you will get at a comic convention. And I have added Gwendolyn, Phill's slightly demanding love interest, Morty Mogg who is based on my oldest little brother, who has this profile @evilhippie, Jörn Shortcut who has translated the comic into German, Vincent Cavanaugh based on my youngest little brother who has an unused profile here on Steemit (Can't remember it right now, but will update) - and last Vincent Celier who asked for the drawing and who I meet when he came visiting me a year ago. I asked my youngest daughter if she could recognise any of the depicted, and she immediately called out both of her uncles and Vincent! (She never met @shortcut and Gwendolyn and Phill are both fictional characters). Quite satisfying for my portrait painter ego. I am very happy with your drawing! You will notice that Gwendolyn have eyes only for me! And say hello to your daughters and your wife. They send many good wishes in your direction. Great drawing, I immediately recognized Vincent Celier! Really happy to be included in this fine group. Thanks and cheers! Of course you are! I had to practice for your wish. Wow you're really great drawer.